For 50 years the African Wildlife Foundation (AWF) has worked with the people of Africa to ensure that the continent's wildlife and wild lands endure forever. Gorillas…98.6% Human won the Audience Award for Best Documentary Short at the 2009 Annual Maui Film Festival. explore, a multimedia organization that documents leaders around the world who have devoted their lives to extraordinary causes, showcased six short films at the Maui Film Festival. Following on the heels of explore’s Guardians of the Sea win in 2008, this is the first time any filmmaker has won two years in a row. AWF Blogs bring you news and stories directly from the people leading the charge for Africa's wildlife conservation. Follow Paul Thomson's blog as he reports on AWF's projects across Africa. 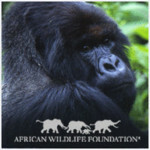 Right now he's blogging with the mountain gorilla rangers in Rwanda. Love leopards? Read about Nakedi Maputla's research on leopards in South Africa's Kruger National Park. See his camera trap photos and what it's like to live with leopards.